The life of scholar, philosopher, activist and historian, W.E.B. 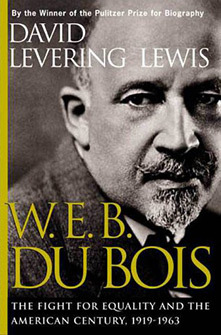 Du Bois, is examined in David Levering Lewis' W.E.B. Du Bois: The Fight for Equality and the American Century, 1919-1963. Fifteen years in the making, this second volume of Lewis' profoundly detailed analysis of Du Bois' life follows the controversial American icon from the race riots of 1919's "Red Summer" through his controversial departure from the NAACP and his embrace of socialism, to his tumultuous self-imposed exile and death in Ghana at the age of 95. The Los Angeles Times Book Review calls it "a work of keen scholarship that will appeal to the general reader responsive to graceful, lucid prose by an author with an eye for ironic situations and complex emotions." Born in Little Rock, Arkansas, Lewis attended Fisk University where he received his B.A. in history and philosophy. He holds an M.A. in U.S. History from Columbia University and a Ph.D. from the London School of Economics and Political Science. Lewis currently holds the Martin Luther King Jr. Chair in history at Rutgers University. Lewis is the author of several acclaimed books including King, A Biography (Praeger, 1970), When Harlem Was in Vogue (Alfred Knopf, Inc., 1971), The Race to Fashoda: European Colonialism and African Resistance in the Scramble for Africa (Weidenfeld & Nicolson, 1988) and W.E.B. Du Bois: Biography of a Race, 1868-1919(Henry Holt and Co, 1993), which won the Pulitzer, Parkman and Bancroft prizes, in addition to the Anisfield-Wolf Book Award for non-fiction in 1994. David Levering Lewis: "History without sexuality is incomplete."